Climbing into a Jeep Wrangler isn't like climbing into any other vehicle. When you get behind the wheel of a Wrangler, there is a sense of possibility and adventure that isn't limited by roads, stock parts or the status quo. 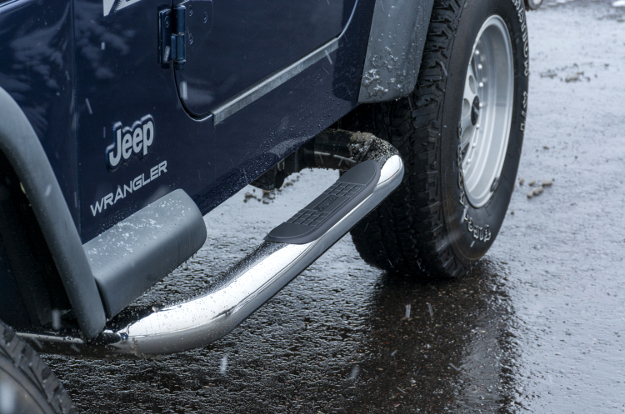 ARIES Jeep Wrangler side steps offer you a confident first step on your next adventure. Whatever your style and wherever you're headed, we have the right finish and a custom fit to complement your own unique Jeep Wrangler build. 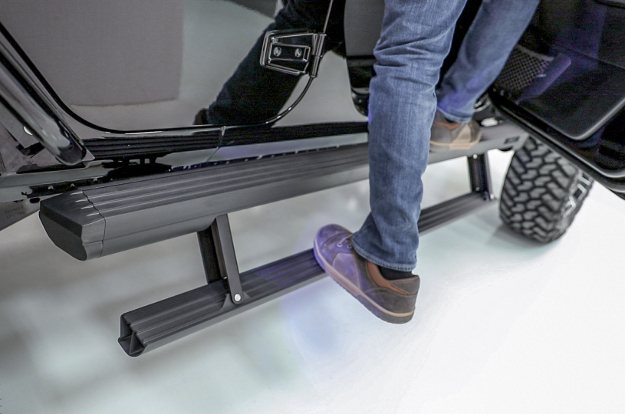 ActionTrac™ powered running boards feature a unique, patented step-within-a-step™ design -- two steps in one – for safer, easier access into your lifted, offroad Jeep Wrangler. The top step also provides convenient access to the roof. These retractable running boards mount with no-drill brackets and no-splice wiring. They mount high and tight against the rocker panels for extra protection and plenty of clearance, and they are constructed from weather-resistant, powder-coated aluminum. 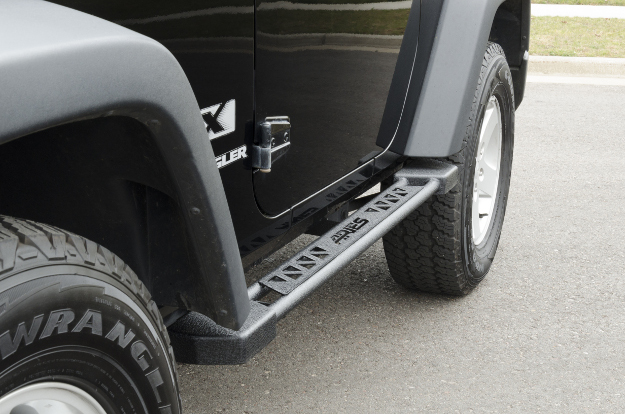 These all-steel, offroad side steps offer extra protection for the sides of your Jeep Wrangler, featuring a double-tube layout with a strong, welded top plate. They also come with pre-welded mounting brackets for increased rigidity and easier installation. 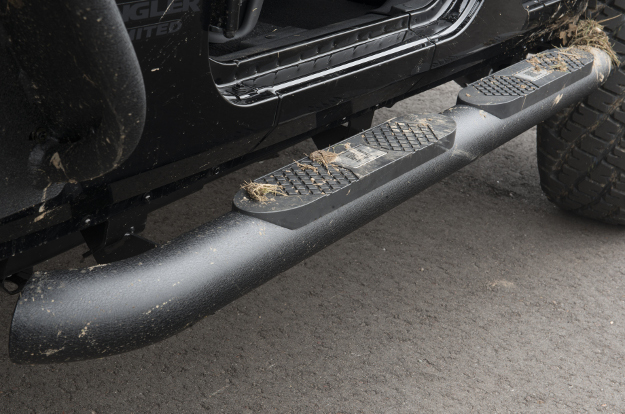 Jeep Wrangler Rocker Steps also offer a solid step up, and because the steps mount close to the rocker panels, they allow for plenty of ground clearance over uneven terrain. Any Jeep Wrangler with 37" tires, a 5" lift kit, a set of offroad fender flares -- or all of the above -- needs side bars that can keep up. ARIES Big Steps™ feature a bigger, bolder design to show well on large, lifted Jeeps. Big Steps™ for Jeep Wrangler are built from 4" diameter, powder-coated aluminum alloy to be strong, lightweight and rust-free. They also have Wrangler-specific bends and step pads to complement the body of the Jeep and give it that aggressive look. ARIES 3" side bars allow you to customize the look of your Jeep Wrangler and get the functionality you need for that next big adventure. They come with custom-placed step pads to match the layout of your Jeep, and they have vehicle-specific mounting brackets for a custom fit with no drilling required. ARIES 3" Jeep Wrangler side bars are available in multiple material and finish options to match the look and style of your custom build.